Many of the visitors range from a variety of ages. We want to keep it child friendly. Please restrain from posting any disturbing content. Act with grace & dignity. Treat anyone just like how you would want to be treated. We won't condone any attacks or allow them to happen. While sourcing to other sites is allowed for discussion, you may not post websites just for "checking out". It will be considered Advertising. Big Pokemon resource sites such as Serebii & any official sites are excluded from this rule. The common language used on the Internet is English, it is rude to communicate in the main chat in a language no one else can understand. While an Auto-Kick bot does exist, if a staff sees you're overly typing consistently, you may be asked to stop. To avoid this, try to pack more words into each message before hitting Enter. While we cannot fully police the amount of usernames people use, we will ban any users that are excessively using different user names. It is a way to elude staff and is deemed a conniving habit. Excessive usage will be determined by active staff on a case by case basis factoring; how many you've used, how often you used them, & behavior on each alias used. 7. No Dodging the Word/Phrase Filter. Word/Phrase Filter in Effect, attempts to get around it will result in kick/ban. 8. No idling if you've entered into a Tournament. While you're a PO Tournament, you're obligated to be challenged & to challenge users in the tournament. Causing delay can be deemed as disruptive behavior. 9. No asking for PO server, MyBB or any extent of Web Hosting support. There are designated places to seek support, such as the Official PO & MyBB forums, or general web hosting sites. It is absolutely rude to ask us for that kind support for any reason. If any of us were volunteeringly providing support, we'd be on those forums already. To attack a member personally or challenge one to attack you. These will lead to temporary bans. Talking about any beliefs is restricted here to prevent discrimination. Like all forums, spamming the board is strictly forbidden. You may post relevant threads. Private Messaging requires 3 posts. Any user(s) spamming just to get the 3 post counts will receive an infraction and a reset of the post count back to zero. This rule extends to all features of GTS, not just the forums. You cannot spam on PokeOnline, PokePedia, & or PokeGear. - Through Friend Codes. Local meetings or finding missions through Nintendo's Online GTS system will not be acceptable. - Through PokeTrade or Trading Post for tracking. Members cannot remove their post content then close the thread. Anyone caught doing this may lose complete access to the Trading features. - With respect to everyone. Scamming will definitely not be tolerated, respond to PMs when you read them so you don't appear suspicious. We have a tracking system for PMs which allows members to check if you read the PMs. During scam investigations, both parties must transfer the involved Pokemon to a staff member to hold until the investigation is over. Any member refusing or fail to provide the correct Pokemon will be declared a scammer & added to our GTS Blacklist. No advertising on our site. This includes putting a web link in your Custom Title, Profile, Signature, Post, PokeGear Chat & or Private Messages. There are exceptions to sourcing content/data from other places. However, you cannot place a link anywhere in your account or post for someone to "check out". The source you're linking directly into must contain the content/data in relation to the topic being discussed. With images, you cannot exceed 700 x 200 pixels on ONE image. The images cannot contain any PokemonGTS.com images such as our GTS icons & Badges. With Text, you cannot exceed 3 lines of text in total which includes both outside & inside a quote. One quote per signature (No quotes within' quotes), & no embedding videos. The Friend Codes bar appears along with the signature, do not abuse it by inputting anything but your Friend Code. In game names, stating the fact that you don't have the game, and anything else is inappropriate and is considered to be abuse. The Friend Codes bar is for Pokemon Friend Codes only, nothing else. Thank-you. This includes (but not limited to) images, files, text, and web links. Anything found offensive can be removed by discretion of any staff. 8. No Off-Topic postings in: Announcement, Support, Trades, Battles, Tournament, & Shop-type Threads. Certain types of threads should not be turning off course. Please stay on-topic in these. For Announcement threads, there is an exception for NEW features. When it's introducing a new staff member, or to bring up a matter with the members, please stay on topic. 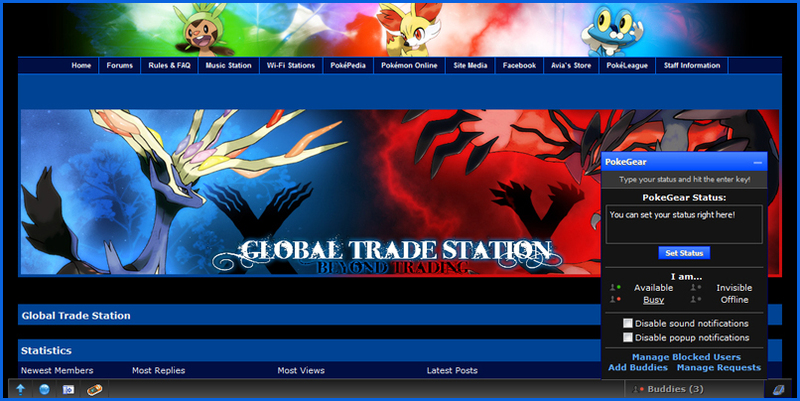 This rule applies to Shop Discussion threads as part of the PokeTrade feature as well. Failing to comply will result in an infraction. If you've seen someone that has violated a rule, policy or just offended you - please report the issue. In each post, there's a report button and in addition we have our Contact Form. Please avoid acting like a staff member as it may offend other members and lead into more problematic issues. Common tough day-to-day rants are allowed, such as relationship breakups, bad school day, & annoying co-workers/boss. However we will no longer allow discussion on extreme personal tragedies. These can include but not limited to; family deaths, financial issues, & or problems with the law. Please contact local friends, families, school counselors or any other local in-person support. Question: What are the possible infractions to be given and what are the punishments? Note that we reserve the right to manually ban any users that are constantly dangling around 50-60%. There is no loophole to avoid a permanent ban and continuing to be a nuisance. Question: Why did I get an Infraction & not a warning? Staff are not obligated to provide a "Verbal Warning" ever. It's illogical to give a warning FOR a warning. If we constantly gave verbal warnings, how are those tracked? They're not. The Infraction / Warning System is a tracked system. For all staff to see from your profile; who warned you, why they warned you, which post they warned you from. Other members cannot see your warning level, so you can't "look" bad in-front of them unless you're a high level troublemaker which we permanently remove anyway. So relax, an infraction or two is nothing. They will subside in time. No Endou will ever win the events. We reserve the right to terminate (banning) your account at any time for the safety of the site, staff and members. Terminations/Bannings happen effective immediately if you violate any of our rules & or policies. - Attitude problem: Being disruptive in any shape or form. - Violation of a rule / policy. - Threatened the safety of oneself or member/staff. "Delete my account, I'd like it deleted." We do not delete accounts. We especially do not do it upon request. You have no obligations to remain with the site, nor do we have an obligation to delete your account & postings. Users are also limited to 1 account. Any duplicate/alternate is not allowed and can result in an infraction to the original account or permanent removal. No associations with Pokémon Company, Nintendo or any of their subsidiaries. Despite how "Professional" we may look to some people, we are only a Fan Community run by Fans. We originally began with a group of classic Pokemon fans in 2007. The entire website is free and will continue to remain that way. We will never ask for money from the members, not even in the form of donations. Be sure to not reveal your private information. If you feel unsafe about someone, or if someone has been harassing you through Private Messages for the information, please report it to an Administrator immediately. Revealing any of your information will be at your responsibility. We the staff, will not reveal your account information to anyone outside of our staff team for any reason unless required by law. Should any parents have questions, please use the "Contact Us" form at the very bottom of the site, selecting "Administrators" as the Subject. You will require a registered account in order to send the E-Mail. We encourage kids to take breaks from the site to exercise and always be cautious when tempted to reveal any personal information. In fact, our policy advises not to. Our primary focus is that this is a family site, and we will continue to maintain that. We will make forum changes if we see it necessary. The Off-Topics forum will cover anything the other forums do not cover. Chat boxes defeat the purpose of a forum and will not be implemented. Mod/Staff changes are administrative business only. It will not be discussed in and or with the public. Max 2 reserve posts on top of the original. Any more than that can warrant a spamming infraction. Under a fair trade, there's no re-distribution clause that prohibits other users from trading your Pokemon away. By accepting the trade you're acknowledging the transfer of ownership of that Pokemon. The user is fully aware of the value both parties are trading and accepts it. - Nintendo DOES NOT allow hacked Pokemon being traded on the In-Game GTS. You could potentially be banned. - Corrupted game file: using hacks or action-replay cheats may corrupt your game. Using cheats, hacks, or accepting Hacked Pokemon in trades are the user's discretion & responsibility. - Close Threads upon request. - Delete upsetting reputations. Note: Reputations can only be reported if they're in violations of a rule or policy. - Delete or ban accounts upon request. While bumping is allowed, users are expected to use it within' a sensible limit. Once every 24 hours is best. Your thread does not need to be on page one 24/7. Users do search and toggle between the first 2 or 3 pages of a forum. A bump should also contribute to the thread - an absolute meaningless post such as "Bump" is considered spam. Necroposting is allowed under either of 2 conditions. The thread's last post is not older than 6 months. If it's not, then you can make even the simplest replies such as thanking a post or continue any off-topic chat if allowed by that section. Your post will contribute to the original topic the thread was intended for. Even if the thread comes from 2007, you may inquire about cheat codes that may or may not work, add your opinion, etc. As long as it's contributing and has meaning. While we welcome everyone around the world, it's unrealistic to support all languages at the moment as not everyone would understand each language used. And clearly an automatic translator can confuse and cause massive miscommunications. To that end, only the English language is allowed. User Reputations are not moderated by staff. Despite how much you dislike being given a Negative reputation, it may not be removed by staff upon request unless it violates a board rule or policy (ex: flaming or foul content). We also do not condone begging for Reps. Reputations are a way for members to thank you for your services on the community, not a form of payment. Users caught doing so may have any number of Reps removed at the discretion of the staff. - Report the post/thread using the "Report" button one time. - If every post in a thread is in violation, please note that in 1 report, DO NOT report every post of that thread. - DO NOT ever report posts / threads by any other form besides the "Report" button. This includes but not limited to: Direct E-Mail, Private Messaging, PokeGear, Cell Phone texting / calling. By choosing to house your Team / Alliance on PokemonGTS.com, you've agreed to abide by all rules & policies here including but not limited to Staff Moderation. Any Team / Alliance that creates a separate site or web chat will be deemed to termination of the housing here and possible infraction for violating the "No Advertising" rule. We will not support any Team / Alliance website, especially if the Teams / Alliances are being housed within' PokemonGTS. The major reason is because we don't control these other chat resources, and they do not abide by our rules & policies. We most certainly do not support Chat-Room applications. PokemonGTS.com Events commonly occur during video game releases with the games being the actual prizes. The amount of prizes may vary up until the game release. The amount of prizes is solely up to the Administration as the cost comes out of our own pockets. It will vary in each event, and may change without warning. - Behavior issues on the board, PO Server, or with staff. - Unable to comply with content/event procedure & or protocols. - Unsportsmanlike conduct with members. Top 25 ranked members are required to submit a set of photos in case they are declared the winner so the images can be used immediately to display them as such. Inability to submit these photos under the requested conditions will result in disqualification in the on-going event. Declared winners are required to submit a second photo or set of photos that has the winners holding the prizes. These photo must be of good quality & submitted within 24 hours of receiving the prize. Failing to comply with this can & will result in the termination of the user's GTS Membership. Staff winners are not exempt. If you can spare a minute to open the prize, then you can spare a minute to take the photo. Members that are 17 and below will require parental or guardian permission to participate in the events, and we will require the parents/guardian to sign a form to claim the prize(s). Members 18 and older will not require parental or guardian permission unless required by law. PokemonGTS.com is not liable for any prizes lost in shipping or prizes not functioning the way they were intended to function. And lastly, physical prizes such as games may not be guaranteed in every event. Smaller-scaled events will give away website titles/badges instead. PokemonGTS.com is not or ever has been affiliated with Pokémon Company, Nintendo or any of their subsidiaries. All Pokémon content are © by Nintendo. All threads/postings are © 2007-2017 by PokemonGTS.com. All user generated content, posts, and discussions, contained on PokemonGTS.com are the intellectual property of PokemonGTS.com. PokemonGTS.com reserves the right to overwrite or replace any affiliate, commercial, or monetizable links, posted by users of PokemonGTS.com, with our own internal tracking. I can't Private Message, why doesn't it work!? You require a minimum of 3 postings before using Private Messaging. NOTE: Do not spam just to get the 3 post counts. I have a "Warning Level" in my profile information with each post, why am I getting this & why doesn't others have it? Each member can only see their own warning level, while the staff can see everybody's. It's nothing to worry about as long as you keep the warning level percentage low or at zero. If you don't continue to receive them, the infraction will eventually expire. How do you pick Moderators or Administrators? I want to become one. The job chooses the people, the people doesn't choose the job. Administrators select staff based on location to cover shifts, skill to contribute to site development, and maturity to see how well one would fit among the team. No member is ever qualified to join the team based on how long they've been around. Long term members can only apply and be reviewed just like any other candidate. We look for experienced and skill individuals. If someone we bring in externally posseses more experience and skills (Drawing, Designing, Web Development), we'd be more interested in hiring them instead. We hire for the best interest of the site, and we will continue to look for who we believe are the best. Never ask about becoming a staff member unless there's a posted position available. In which case you may inquire about the position for more information if needed. What's the chain of command on staff? Affinity Ops reports to Management. System Ops reports to Management. Why haven't you installed my suggestion(s) yet!? It takes time for something to be implemented. Beneficial and flaws are reviewed and it's prioritize into a list of features to test & install. Your suggestion isn't the only feature we may have planned to upgrade. Something else just might have priority over it. Please be patient. Why can't I delete my threads/posts? Because that job belongs to Staff. If there's something wrong there, report it to a staff member and they'll use their best judgement. We simply don't want users deleting evidence of disputes to avoid the punishments. How do I edit/change my "Trainer Status"? And a new password will be sent to the E-Mail associated to your account. You should then immediately change your password to something else. Can you please DELETE my account? I don't want it anymore. No. If you choose not to use the site anymore, then just stop using your account. Your account will not be deleted, nor will your posts. We do not delete accounts upon request. Deletion of accounts may cause problems with our database, including threads with broken conversations. My account doesn't work, where can I E-Mail for help? This is the best method as all postings need to be validated by a staff member first, so whoever reads it first will assist you. And yes, guests can post here, so you do not need to be logged in to be able to ask for help. How do I obtain a Badge? Badges cannot be requested nor can you ask others to nominate you. Badges are for recognition of your accomplishments on the board. Asking/begging for badge nominations means you're not being recognized for the accomplishments. However you can nominate other users for certain Badges, more information about that can be found here. Where can I view all the available GTS icons? How do I use GTS icons? How can I change to something different? Are there spoiler tags and how can I use it? When used, your text will be blacked out, and other members will have to highlight over it in order to read the message. I'm locked out of my account, what do I do? How can I get help? There's no need to panic if you're locked out of your account. We have two steps to go through to help you recover, but you must follow these steps. - We will not reset your password for you immediately, you must try other solutions first. - You may not just create a new account. The new one will be banned. Do whatever it takes to get into your E-Mail account to get the password reset. If this fails, you may then contact us. - Post on the same computer you normally use. - State your account's E-Mail address for verification. - State your Passphrase for verification. Once we've cleared the verification, we will manually reset the account for you. We have these procedures in place to prevent someone from hijacking another person's account. We appreciate everyone's patience and understanding. The Passphrase is something you write yourself, that only you would know and only staff can check to verify. Please make sure you've entered this on your account while you can in the event that you need assistance on recovering your account. How do I use Pokemon Online aka PokeOnline? PokeGear Messenger is a bar on the bottom of the site for members. What is PokeGear Messenger & what is it for? PokeGear Messenger is a bar located on the bottom of the site. It will only appear for users logged in. It is a faster form of communication. However, users can only communicate with members on their "Buddies" list. Members are also able to play games with each other using the PokeGear such as; Checkers, Chess, Battleships, Domino, Sudoku, Backgammon, 8-Ball Pool, Cheat, and much more. Why can't I message just anyone in PokeGear? While that is possible, there needs to be control. Some members can cross the line on communication and push into harassment. If there's someone you no longer want to receive messages from, simply remove them from your "Buddies" list. Otherwise there's no control over who can message you. Rules & Policies for all Trading on GTS. The number one rule to all trading is, no scamming. Users scamming will be dealt with harshly, no exceptions. Each carries it own set of regulations. With PokeTrade Shops, owners must post their entire trading inventory within the PokeTrade system, and not in the discussion threads. With the Trading Post, owners are limited to 3 posts in total in the thread, the original post and 2 additional "reserved" posts. If collaborated shops occur in the Trading Post, the reserved post limit is max 3 (including the original thread post) or 1 per shop owner. So this does mean if there's 5 people, the shop can have up to 5 owner posts (including the original, 1 per each owner). Bumping is allowed but it must be limited to a 24 hour period, and the post must contribute. The bump must include some form of update information; Out of Stock on certain Pokemon, new Pokemon added, response to member questions, etc. It cannot be repeatedly asking for interesting, for simply just "Bump". It must contribute, that's the prime definition that separates a meaningful post and spam. Answers to how the League System & Teams work. If a team exceeds the limit of members allowed, the team can be disqualified. There are two GTS Leagues, 1 for Wi-Fi, and 1 for Pokemon Online. Details on how either one works are subject to change. But the gist of it all, is there are generally about 8 teams that can compete in tournaments held every quarter of the year. I'd like to be a Team Leader, how do I create a team? Team Leaders are voted by the community. There can only be 8 to 10 teams, depending on the rules of each quarter tournament. The only way a new leader can join in is if an existing leader would like to give away their team, or pull out entirely. I'd like to join a team, how do I do so? Post in the "Free Agency" forum sections under the League category. Make yourself available to all teams. What are the rules for each League? Our team needs a new Leader, what do we do? If your team needs a new Leader, please report this to the GTS Coordinators immediately via the Contact Form. We can make the Leader change on the League System. I don't want to be a Leader anymore, what can I do? Your best option is to seek a replacement Leader, you are still responsible for all Leader duties and assisting the new leader until he/she has completely settled in. If you cause any damage to your team by going in active or causing the team to become inactive, punishments will be decided. They can range from League System blacklist, an infraction that will last up to 1 year, & a possible permanent ban. Each case would be reviewed and the punishment would be decided. A Leadership role is a big responsibility. I want to quit my team, what do I do? Speak to your Team Leader. You must provide sufficient time.You must give notice at least 5 days before the recruiting deadline. You are also restricted from resigning once the Tourney has began. If you fail to do either one, you can be punished. What if I wanted to change from WiFi to Shoddy League or vice-versa? You must miss 2 Quarters. For example, if you first compete in a Wi-Fi league, then would like to switch over. You cannot participate for the next (1) Shoddy Leagues and (1) Wi-Fi League. Report to GTS League Coordinators to get added to the "Change" list via the "Contact Us" form. A Free Agent is responsible for using the prefix "Available" when posting in "Free Agency" forum(s). If an agent has dropped out, the agent is responsible for updating his/her "Free Agent" thread's prefix from "Available" to "Dropped-Out"
And finally, if the agent has been recruited, they're responsible for updating the prefix to "Recruited". Please note, an agent cannot be recruited into a team until they have made a thread, and it is officially 24 hours old. Any agent attempting to join a team before they do this can be disqualified and punishment by infraction. The same punishment can be dealt to the Leader, including team forfeits if the agent is used. - Ensuring the team is active. - Registering for Quarter Tournaments when held. - Reporting updates to GTS League Coordinators. - Ensuring new recruits are updating their Free Agency threads. - And anything else that may be required for the benefit of the team. GTS League Coordinators reserve the right to dismiss and replace a Leader if they are not fulfilling duties & or directing the team on the correct path. - Blacklist from all leagues. - Infraction that sticks to the account for 1 year. This would keep your infaction level near 90% for majority of the year. When does each League begin? Each league begins in a quarter of the year. Wi-Fi first starts off in 4th Quarter of 2009. Shoddy will come next in 1st Quarter of 2010, and Wi-Fi again next in 2nd Quarter of 2010. It's a repeated cycle where each one takes a turn. Learn how to add Polls. Learn how to use Forum Codes to enhance your posts.